My favorite way to preserve delicious home grown summer tomatoes is to dry them. They are easy! Eat them as a snack or chop them up and put them in, on, or around pretty much anything. Preheat oven to 200 degrees. Cut tomatoes into quarter-inch slices and lay them on a tray in a single layer. Using a silicone mat or parchment makes cleanup easy. 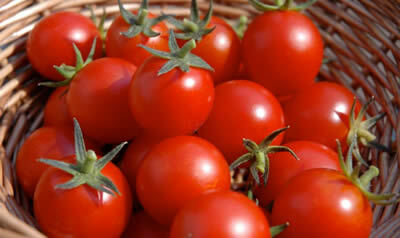 Very lightly salt them, then dab a finger in the oil and lightly rub it onto the tomatoes, just enough to moisten them. Place tomatoes in the oven for about 2.5 hours. Halfway thru, rotate the trays. They’re ready when they’re like fruit leather: dried, chewy, no visible juice but still a pliable. If 2.5 hours doesn’t do it, keep checking on them every 15 minutes. When they’re done, remove and let the tomatoes cool on the tray. Store them in an airtight container. I keep mine in the fridge in case there’s still some residual moisture left in them which can cause them to mold. Cover them in olive oil, if you’d like, which will flavor the oil. They keep for months. Delicious!